More than 1,400 Utahns ages 18 to 20 carry concealed firearms. Here’s why. 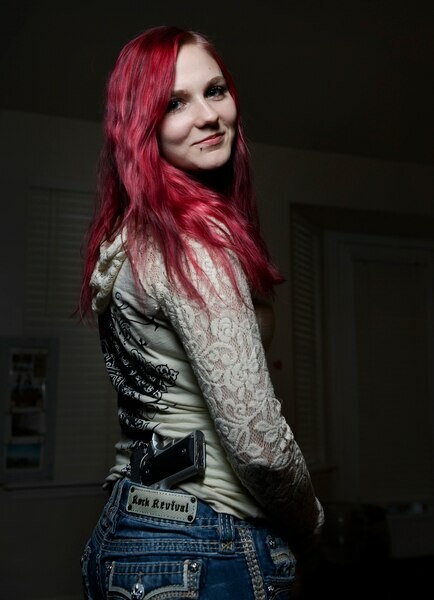 (Leah Hogsten | The Salt Lake Tribune) Jacee Cole, 20, said a stalking incident in a store as a teenager spurred her to get her concealed carry permit when she was 19 years-old for self defense. Cole, shown at home Friday, March 2, 2018, now carries a Kimber .9mm pistol in her purse or the waistband of her pants that she conceals by wearing a sweatshirt or a coat. I don't trust people, said Cole, who said she respects law enforcement, but questions whether the police would be able to arrive at any given situation in time to thwart a possible incident or crime. It makes me feel safe, knowing I can protect myself. (Leah Hogsten | The Salt Lake Tribune) Jacee Cole, 20, said a stalking incident in a store as a teenager spurred her to get her concealed carry permit when she was 19 years-old for self defense. Cole, shown at home Friday, March 2, 2018, now carries a Kimber .9mm pistol in her purse or the waistband of her pants that she conceals by wearing a sweatshirt or a coat. I don't trust people, said Cole, who said she respects law enforcement, but questions whether the police would be able to arrive at any given situation in time to thwart a possible incident or crime. It makes me feel safe, knowing I can protect myself. (Leah Hogsten | The Salt Lake Tribune) Jacee Cole, 20, said a stalking incident in a store as a teenager spurred her to get her concealed carry permit when she was 19 years-old for self defense. l-r Cole, shown at home with her husband, Russell Larsen, and step-daughter Katilyn, 11, Friday, March 2, 2018, now carries a Kimber .9mm pistol. I don't trust people, said Cole, who said she respects law enforcement, but questions whether the police would be able to arrive at any given situation in time to thwart a possible incident or crime. It makes me feel safe, knowing I can protect myself. (Leah Hogsten | The Salt Lake Tribune) Jacee Cole, 20, said a stalking incident in a store as a teenager spurred her to get her concealed carry permit when she was 19 years-old for self defense. Cole, now carries a Kimber .9mm pistol in her purse or the waistband of her pants that she conceals by wearing a sweatshirt or a coat. I don't trust people, said Cole, who said she respects law enforcement, but questions whether the police would be able to arrive at any given situation in time to thwart a possible incident or crime. It makes me feel safe, knowing I can protect myself. (Al Hartmann | The Salt Lake Tribune) 20-year-old Jared Larson, carries a concealed firearm with a new provisional state permit. He wears his 9mm handgun in a hoslter on his right hip but always has it covered by a jacket. People don't even know it's there. He carries most places including school, work and church. 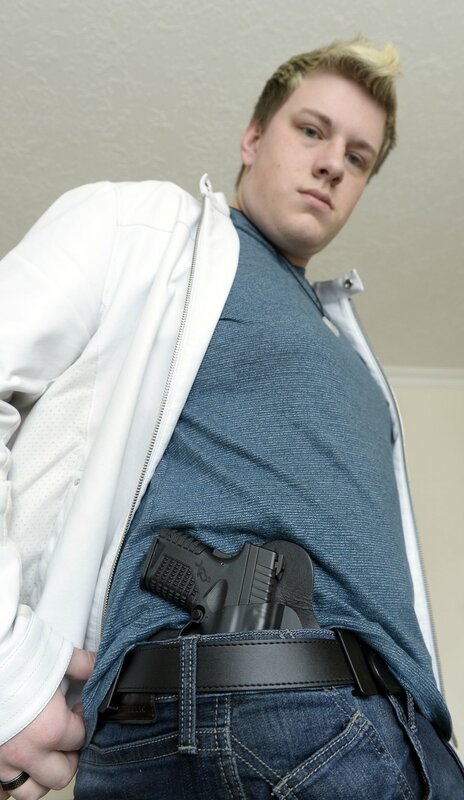 (Al Hartmann | The Salt Lake Tribune) 20-year-old Jared Larson, carries a concealed firearm with a new provisional state permit. He wears his 9mm handgun in a hoslter on his right hip but always has it covered by a jacket. People don't even know it's there. He carries most places including school, work and church. Each aisle she turned down, he seemed to be there. By the shelves of Cap’n Crunch and Cocoa Puffs. By the cans of chicken noodle soup and pinto beans and pasta sauce. By the rows of fresh lettuce. And when Jacee Cole went to check out, he was there by the cash registers, too. She didn’t know who he was or what he wanted or why he was watching her. “I think I’m being followed,” she whispered to her mom on her phone. As Cole pulled out of the grocery store parking lot, the man appeared again in her rearview mirror and tailed her into her Magna neighborhood. She called police, but he drove off before officers arrived. She worried he would come back. If he did, Cole wanted to be able to defend herself. She’s not the only one. Since the reduced age limit took effect on May 9, the state has issued more than 1,400 permits for 18- to 20-year-olds to carry concealed firearms. That includes 107 in January alone. And in the wake of the deadly school shooting in Florida last month, gun-rights advocates anticipate the numbers will go up even more as young adults search for a sense of security in a handgun. State Rep. Karianne Lisonbee, R-Clearfield, sponsored the proposal to allow adults under age 21 to obtain concealed carry permits as a freshman legislator last year. She wanted to equip young women who might have to defend themselves against potential rapists or attackers, particularly on college campuses. “I just wanted to empower those who felt they would be more secure and be able to protect themselves by carrying a gun,” she said. It’s unclear how many of the permit holders are women (the state’s Department of Public Safety doesn’t break down the numbers by gender in its quarterly reports). But even if just one woman had signed up, Lisonbee said, it would have been worth it to her. 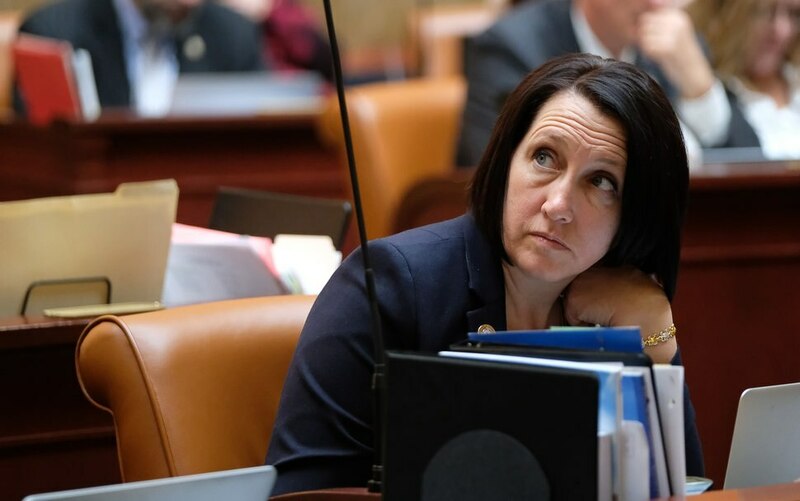 Francisco Kjolseth | The Salt Lake Tribune Rep. Karianne Lisonbee, R-Clearfield, sponsored HB198 allowing 18- to 20-year-olds to obtain permits to carry concealed guns, mainly based on arguments that it would allow young women to defend themselves against rapists. Previously, applicants had to be age 21 or older. Opponents, though, suggest the lawmaker’s argument doesn’t pan out in Utah, where there is a high rate of sexual assault and gun ownership is prolific. “I’m not sure why we continue to think that we’re going to solve issues of crime or violence in the state by encouraging more violence,” said Jean Hill, government liaison for the Catholic Diocese of Salt Lake City. Most in the state didn’t support the measure when Gov. Gary Herbert signed it into law a year ago. Some 60 percent of residents were opposed, according to a Salt Lake Tribune-Hinckley Institute of Politics poll conducted in March 2017. Women disliked the measure by an even larger margin, at 69 percent opposed, compared to 52 percent of men. And its most loyal defenders are, of course, the ones who want to carry. Jared Larson slipped his right hand under his jacket and pulled out a small pistol. There wasn’t bullet in the chamber but, to be safe, he aimed it at a watercolor of pink flowers hanging in his parents’ living room. Larson, 20, got the gun last month from a private seller. After a student was shot and killed at the University of Utah in October, he felt afraid each time he left his Centerville home. His mind frantically ran through scenarios of an active shooter appearing in a pew at his church or pulling up to the drive-thru window at the fast-food chain where he works. The $450 firearm felt like an investment in his life and his future. He carries it nearly everywhere. “I got too scared,” he explained. (Al Hartmann | The Salt Lake Tribune) Twenty-year-old Jared Larson carries a concealed firearm with a new provisional state permit. He wears his 9mm handgun in a holster on his right hip but always has it covered by a jacket. He carries it most places, including school, work and church. The permits for 18- to 20-year-olds are considered “provisional” and have one major restriction: These young adults can carry anywhere a regular permit holder can, except for on elementary, middle school and high school grounds, said Jason Chapman, a firearm supervisor with Utah’s Bureau of Criminal Identification. That’s because a provision in state code expressly prohibits a person under the age of 21, regardless of “a permit of any kind,” from having guns on K-12 properties. It’s by that statute that teachers in the state are allowed to carry. Meanwhile, most public universities and colleges in Utah permit concealed firearms on campus (though they are banned at the privately owned Brigham Young University, LDS Business College and Westminster College). Guy Bolduc brings his handgun to classes at Salt Lake Community College. For him, it’s both a precaution and “a way of life.” His family has always had guns, and he got his concealed carry permit shortly after returning home from a mission for The Church of Jesus Christ of Latter-day Saints in August. That responsibility, he said, the thought that he might have to be willing to take another person’s life, adds some weight to a gun that’s roughly 48 ounces. An 18-year-old can vote. An 18-year-old can serve in the military. And, in all but two states (Hawaii and Illinois), an 18-year-old can buy an assault rifle like the AR-15 used by the Florida gunman. The restrictions are much tighter on handguns, according to the Giffords Law Center, with 15 states banning anyone under 21 from purchasing one and 10 banning anyone under 21 from owning one. Jack Hampton has experience with both weapons. He joined the Marine Corps for a year and “spent every day carrying a rifle.” Now, while on reserve duty in Utah, the 20-year-old carries a concealed handgun. It’s made him feel less vulnerable while living off base after being trained “to see everybody as a possible threat.” But he doesn’t advocate for most young adults to carry. He worries they might be too jumpy, too inexperienced, too careless, too immature. An 18-year-old can also still be in high school. For Steve Gunn, that’s too young. He fears permit holders under 21 will have a higher rate of accidental shootings. He also warns that Utah teens and young adults have a high suicide rate — making it the second leading cause of death in 2015 for residents ages 18 to 24 (and the first for ages 10 to 17). Most of those deaths involved firearms. “For a high school student to be carrying a concealed weapon is very bad public policy and a potentially dangerous situation,” said Gunn, a board member of the Gun Violence Prevention Center of Utah. But Utahns as young as 18, for instance, can purchase, possess and openly carry firearms. (Rick Egan | Tribune file photo) W. Clark Aposhian has taught concealed-carry classes for legislators, public officials, the governor and hundreds of other Utahns. 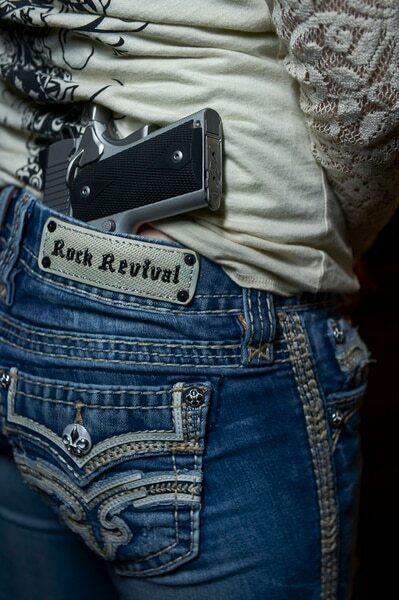 There have been a few times when Jacee Cole has felt nervous enough to start reaching her hand around to where her pistol is pushed into the waistband of her jeans. But she hasn’t pulled it out. And she hasn’t fired at anyone. Years ago, maybe when her house was broken into or when a group of guys chased her down the sidewalk as she waited for police to show up or when a man stalked her at the grocery store, she might have. She doesn’t know for sure. Mostly, Cole hopes she never needs to. Last year, Utah’s new provisional permit made up less than two percent of the more than 68,000 concealed carry permits the state issued. It isn’t much, but Cole believes it’s enough to send a message.